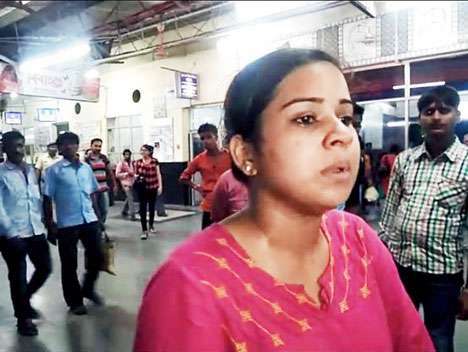 Raiganj: A first-year student from Calcutta jumped out of a train at a station near Malda to chase a youth who had snatched her bag and cellphone on Wednesday night. Maitrayee Jha, travelling with her parents in a reserved coach of the Howrah-Malda Town Intercity Express, could not catch the youth as he scampered away and melted into the darkness. "I was sitting near one of the doors of the coach. The train reached Khaltipur station around 10.45pm. Suddenly, a youth got in and within minutes, snatched my cellphone and bag and jumped out," said Maitrayee. The chemistry student of Calcutta's Jogamaya Devi College screamed and alerted the other passengers and jumped out of the door soon after. "I felt I should not let him escape. I ran behind him. The train was still standing and the miscreant went on the other side of the tracks by getting under a coach. I also crouched and went to the other side. I ran for a few metres but he managed to melt into the darkness," said Maitrayee, a resident of Malda. Maitrayee's father Tusharkanti Jha followed his daughter while the other passengers alerted some Railway Protection Force (RPF) personnel on duty in the train. By then, the train had started moving and the passengers had to pull the chain to halt it so that the father and the daughter could board. "It was only when we returned to the coach that I saw some policemen in the train. Ever since the train left Howrah, we had not seen a single policeman in the coaches," said Tusharkanti, a headmaster in a Malda school. Tusharkanti's wife Jayashree said she was worried her husband and daughter might be attacked when they went after the miscreant. "I was resting on the seat when my daughter's screamswoke me up. I saw her jump out of the train, followed by my husband. They returned after some time. I was worried because the miscreant might have attacked them," said Jayashree. Around 11.15pm, the train reached Malda Town station where the family went to the GRP and filed a complaint. Purnendu Kundu, inspector-in-charge of the local Englishbazar police station in Malda, also reached the station, promised assistance in the probe and said he suspected that the miscreant was from Malda. "My cellphone had fallen out of my pocket when I jumped out of the train. I have learnt that the police have recovered it. But we are yet to get back the belongings of my daughter. She has lost two cellphones, some cash, spectacles and some other items," said Tusharkanti. In March this year, at least three passengers, including a woman, were assaulted by a group of youths in a sleeper coach of the Sealdah-New Alipurduar Teesta-Torsha Express. The incident occurred when the passengers asked the youths to leave their reserved berths. The youths occupying the seats had refused, leading to an altercation that soon snowballed into the attack. The youths brought in some others who assaulted the passengers a Bhaluka Road station, around 55km from Malda. A first-year student from Calcutta jumped out of a train at a station near Malda to chase a youth who had snatched her bag and cellphone on Wednesday night.